The free program Image Uploader is actually more than just another program to upload photos from a local system to the Internet. You can use it to transfer any file to the Internet, and the name is probably a relict of the past, back when the developer started work on the program. Image Uploader is available as a portable version and installer, which both offer the same functionality. All options are displayed on the first screen after startup. Here it is possible to add images or files to the upload queue, make a screen capture or import a video file. Files can be added individually or in bulk by selecting a folder that contains them via the built-in file browser. Options are also provided to add images from web urls or the Windows Clipboard. All images and files that have been selected for upload are displayed on a preview screen on the next page. Here it is possible to add more files, remove files from the list or display the file properties which displays the standard Windows file properties dialog. The next page displays settings and upload options. It is on this screen that you select one of the supported image hosts and file hosts, the default image format and quality or if thumbnails should be created automatically. Image Uploader supports more than 20 different image hosting providers and eight different file hosting providers. Among the image hosting providers are popular companies like ImageShack, Picasa WebAlbums or Imgur and many lesser known ones. Rapidshare and SendSpace are the most popular file hosting providers. 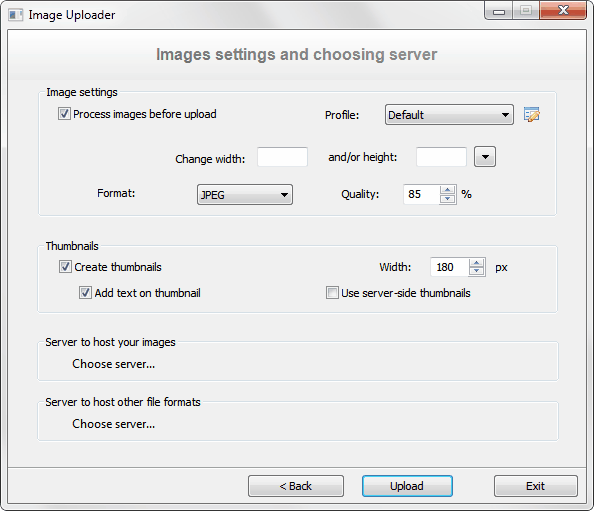 There is furthermore an option to upload the selected images and files to a custom ftp server. Some hosting solutions, like the ftp server, require - or support - accounts. You can for instance add your Rapidshare or Sendspace account to the program to link it to the file and image uploads. A click on Upload starts the transfer. 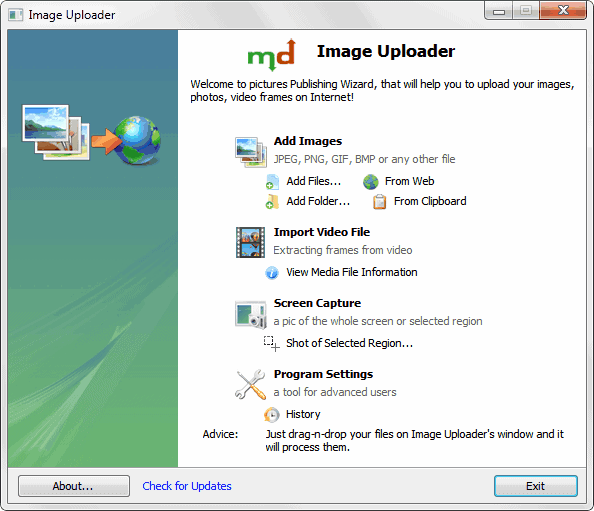 Image Uploader displays a log window where the upload progress and the available image and file hosting links are displayed. Tabs are available that sort the links by forum code, HTML code and links. It is furthermore possible to change the code type, for instance from a table format of clickable thumbnail images to direct image links. The information can be copied and pasted directly by selecting them and pressing Ctrl-c, or with a click on the Copy to clipboard button in the interface. 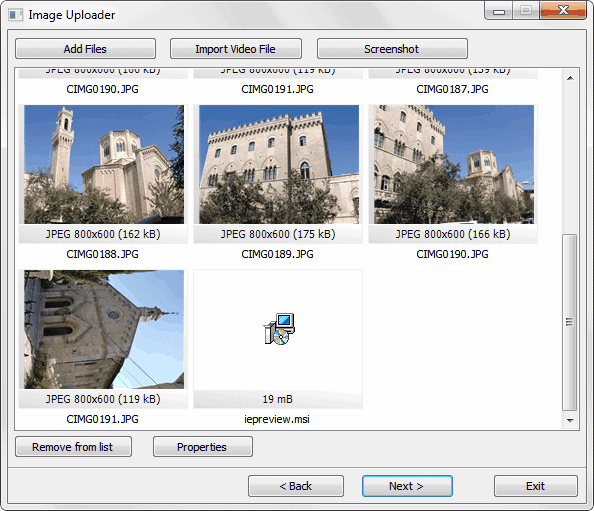 Image Uploader stores all uploads in a history file with options to open them directly on the Internet or to display and copy their codes again. Other features are worth mentioning. You can use the program to capture part or all of the screen and upload the screenshot to the Internet. The application supports various screen capturing formats, from capturing the entire screen to the active window and freehand captures. Another interesting option is the ability to grap a handful of frames from a video file and upload them to the Internet. That's great for previews for instance or a video site where movies and tv shows are reviewed. It takes less than a few seconds to capture images from a selected video file. Image Uploader is a very sophisticated program. It could use a better looking startup screen or options to do automatic uploads after capturing the screen, but those are not major issues. The software offers a lot of excellent features that most other uploaders do not support. Downloads of the portable version, setup and source code are provided at the project's Google Code website. Sounded very interesting. Tried to upload a file to my one of my ftp servers and the file went to multi-upload rather than the ftp with the link provided being incorrect (file not found). Changed the passwords on the server immediately; with the missing / redirected upload and with full login information passed, who knows that might be done with it. If it is a programming glitch, the software is not ready for prime time. If it is something else, it certainly works as a great data miner! I used the portable version when testing. Rick that sounds really bad. I actually have not tried uploading via ftp. The image and file uploading to hosts worked flawlessly. Maybe it’s just the portable version – not sure; the portable only comes in the latest alpha version so let’s just say that cautious is very good. Great tool! Maybe one of the best tools gHacks ever featured. I’ve been looking for such a software that will support multiple image hosting services and integrate to right-click context menu. This tool does both. Hopefully it gets better in the days to come. Good software, I liked it, good alternatives to Jing and Lightshot. Help me upload my pictures to face book. I have just tested Image Uploader 1.2.7 Build 4175 (the portable version) and the FTP upload works fine.